Pikes Peak South Slope open to public first time in 100 years this weekend and next Thur-Sun before it closes for the winter. A permit must be purchased before going or they won’t let you through the gate. Permits are $15 per vehicle for up to 8 people. Get the details on the Colorado Springs website. I did a guided hike 4 years ago and have Pikes Peak South Slope photos and post here. 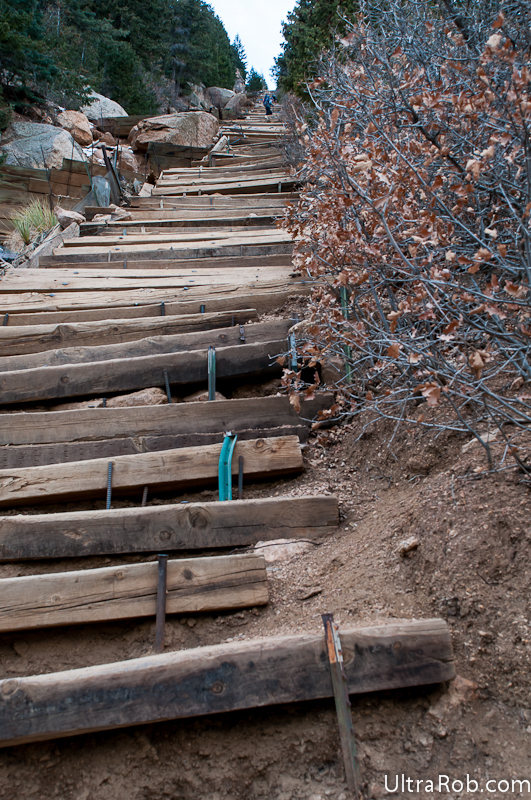 This Saturday, September 13, will be the first of 3 work days this fall for the Manitou Incline. The other 2 are October 11th and November 1st. Timberline Landscaping is doing the hard work on the Incline while it’s closed for repairs through the end of November/early December. 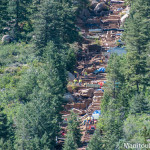 They’ve been using a helicopter to move heavy equipment and material up to the steep part of the Incline. This first work day for volunteers will be on the trail that connects the top of the Incline to Barr Trail. This connector trail has been a social trail with serious erosion issues and multiple paths. The social trails will be closed and a new sustainable trail will be built. Participants must be 12 years or older, anyone under 18 must have a guardian accompany them during the workday. Check-in/late registration the morning of will begin at 7:30 a.m., in the Barr Parking Lot. The project will begin at 8 AM and end at 3:30 PM. Please come prepared to work the entire day and hike 3 miles up Barr Trail to the project work site. Tools will be provided and brought to the project work site by staff. You will need to bring and hike with your own gloves, water, hat, sunscreen and lunch. The trails in the Bear Creek drainage are some of the most popular trails in the Pikes Peak region. Recent testing has revealed that the fish in Bear Creek (approximately 750 adults) are the sole remaining genetically pure population of greenback cutthroat trout. The population is currently listed as threatened under the Endangered Species Act. It seems strange that such a heavily used area is the only place that the fish have survived. I’ve been hiking and riding these trails for over 25 years. Here’s a Jones Park ride report from a couple years ago. The Ring the Peak mountain bike race also uses these trails. The US Forest Service was sued by environmental groups for not sufficiently protected these fish. In the fall of 2012, Bear Creek Trail (666) and Captain Jacks Trail (667) were closed to dirt bikes and camping was prohibited in the area. Last fall the Forest Service got public input on trail closures to all users and alternative re-routes. Now they’re getting public input on proposed changes. There’s an open house tonight (2/25/14) at the Colorado Springs Utilities’ Leon Young Service Center, 1521 Hancock Expressway from 5:30 – 7:30 PM. If you can’t make tonight’s meeting, you use the comment link on their web page through March 27th..
There’s information about the proposed trail and access changes on the Bear Creek Watershed Assessment & NEPA page on the Forest Service website. The good news is they’re proposing rerouting trails and not completely closing the area although it appears Jones Park itself would be off-limits. It appears to me from the maps that Alternative B keeps most of trail 666 except for the cool section right near the current Captain Jack intersection. Alternative C shows 666 as being closed which would be a real bummer. I live close to Ute Valley Park. 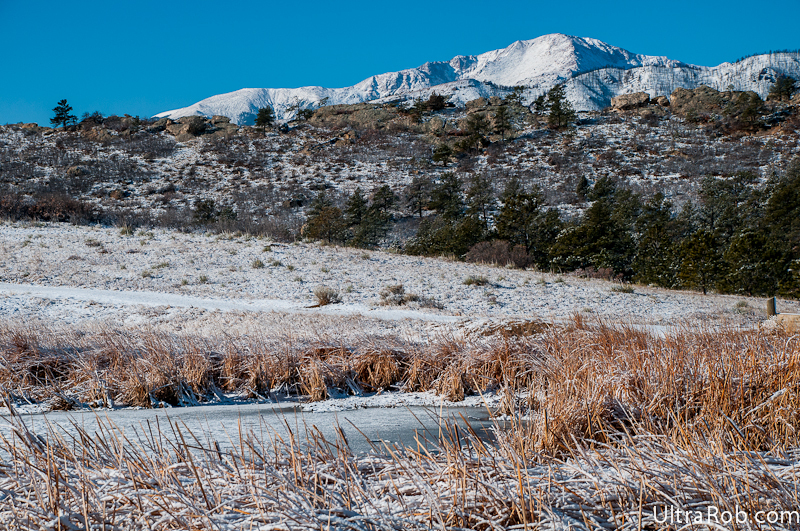 It’s a beautiful 338 acre open space surrounded by neighborhoods but it’s easy to feel like you’re outside the city. I’ve been mountain biking in it for years and now that I live close I hike in it with my family. 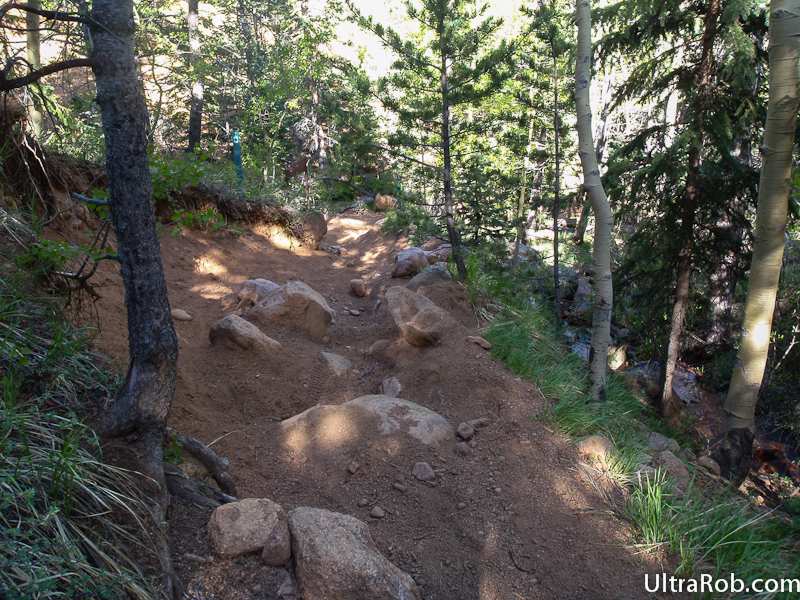 Ute Valley is a popular with hikers, runners and mountain bikers. It has become more heavily used since the Waldo Canyon Fire closed Mountain Shadows Open Space and Blodgett Peak Open Space. Most people don’t know that about the eastern half of the area is not part of the park but is owned by HP. There are a few No Trespassing signs near trails at the HP property boundary but people have freely used trails on HP property. 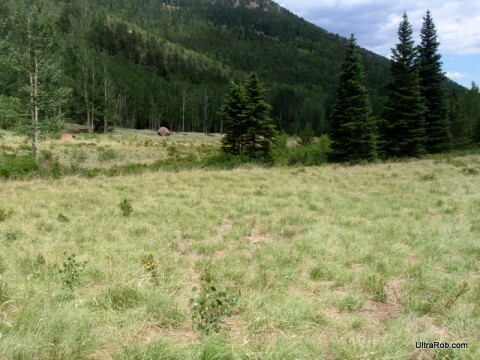 Last summer’s Pro XCT in Ute Valley Park course included trails on the HP property. 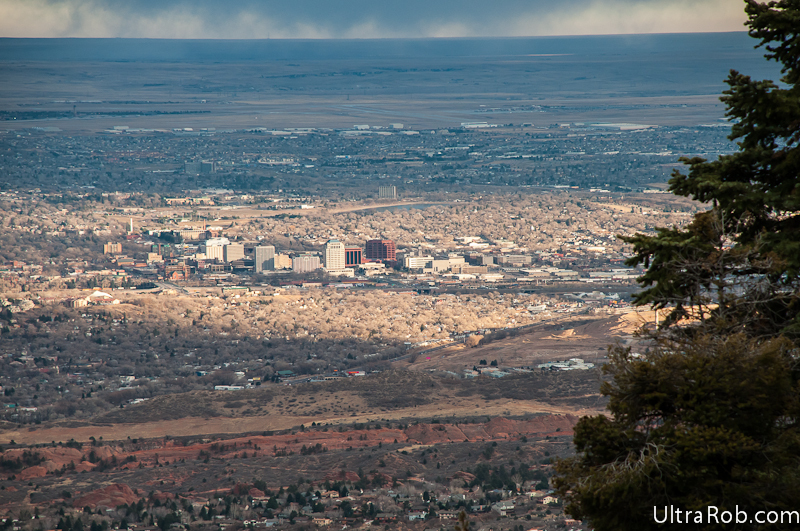 Concerns about the HP property being developed and the increase in social trails prompted the creation of the Friends of Ute Valley Park (FUVP) last fall. Ute Valley has been the last Colorado Springs open space without a friends group. I’ve been working on the Friends of Ute Valley Park website the last couple months. I still have plenty to do on it but we’re using it post new on the park. We also have a FUVP Facebook page. 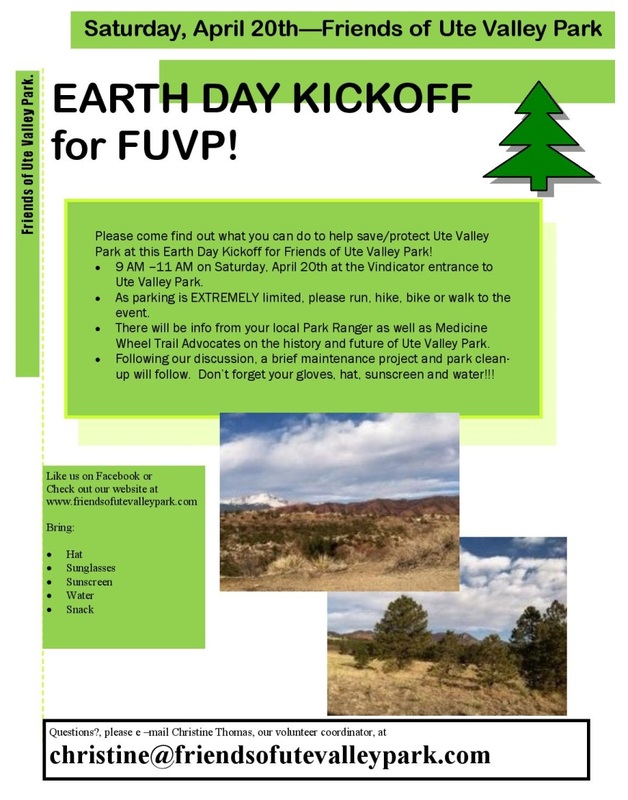 Tomorrow, Saturday April 20th, there will be an Earth Day event at the Ute Valley Park parking lot on Vindicator 9-11 AM. 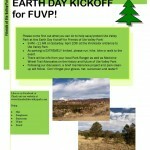 The park ranger, Friends of Ute Valley Park and Medicine Wheel Trail Advocates will be there with information. There will also be a brief maintenance project and park clean up. Please come out and join us. Last year it was determined that the 750 greenback cutthroat trout living in Bear Creek near Jones park are the only genetically pure greenback cutthroat left. The US Forest Service was sued by environmental groups for not sufficiently protected these fish. Last fall Bear Creek Trail (666) and Captain Jacks Trail (667) were closed to dirt bikes and camping was prohibited in the area. Now the Forest Service is proposing closing 3.5 miles of trail along Bear Creek to all users. While I’m for protecting the fish and agree there’s still erosion problems in spite of all the work the dirt bike groups have done, I have trouble believing closing the trails is necessary. It seems strange that such a heavily used area is the only place that the fish have survived. Since they have survived, why is it necessary to close the trails? It seems that rerouting the trail in places and adding more erosion control should be sufficient. 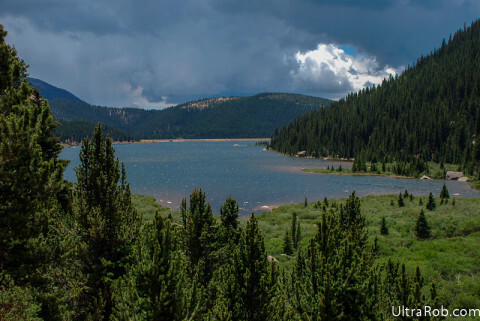 The USFS has a webpage with a several detailed documents on the assessment process. The detailed trail assessment includes a map of the affected trails. The proposal has some possible trail reroutes and at least one would allow connection to the proposed Missing Link Trail which would be really cool to have completed. The information on these possible reroutes start on page 74 of the trail assessment document. Medicine Wheel has some good comments on the proposals. Tonight, Thursday March 4th, there will be an Open House from 4:00 – 9:00 p.m. at the Leon Young Service Center (1521 Hancock Expressway, Colorado Springs, Colorado 80903). 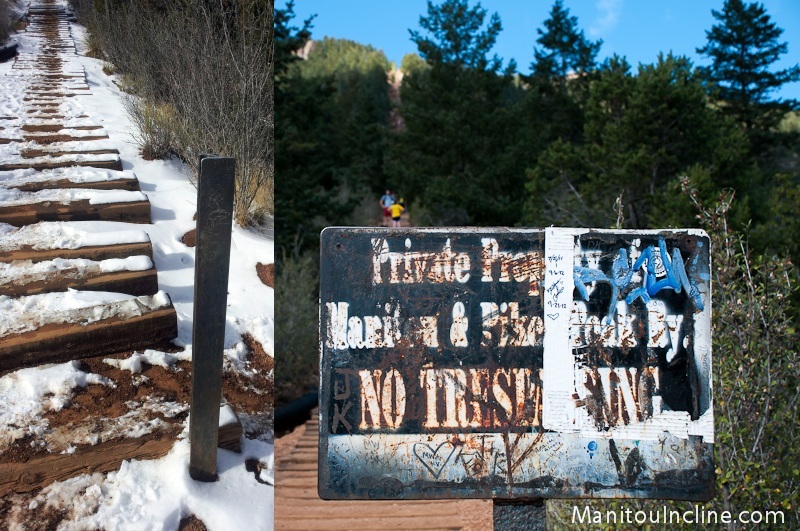 The No Trespassing sign was removed from the Manitou Incline the end of January since the Incline became legal to hike on February 1st. The Incline Friends are giving you an opportunity this weekend to get your photo with the Incline No Trespassing sign one last time. This Saturday and Sunday, February 23rd and 24th, the Incline Friends will have the old Manitou Incline No Trespassing sign at the bottom of the Incline from 7 AM until 11 AM. Donate at least $5 to help with maintaining the Incline and they’ll take your picture alongside the sign. They’ll e-mail the photo to you or they can use your camera if you like. No limit to the number of people in the shot so bring your friends. This will be your last opportunity to get a photo with the sign and the Incline before it’s retired to the Pioneers Museum. 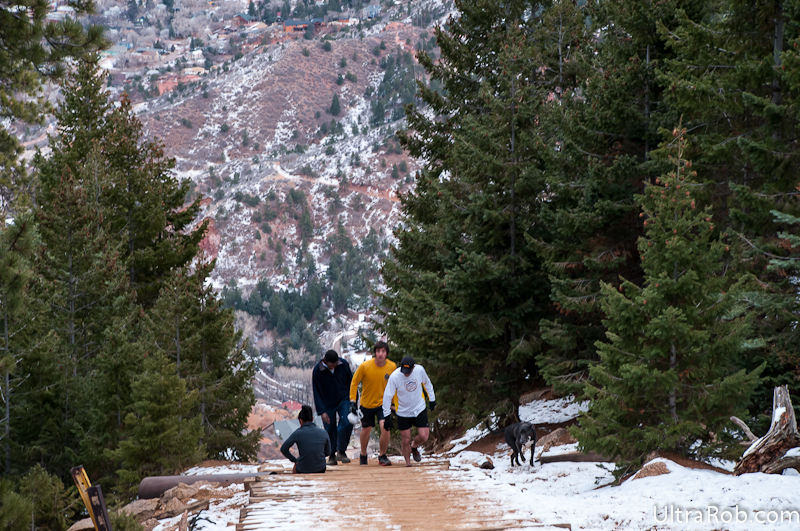 If you plan on heading up the Incline after getting a photo, be very careful. After a dry winter, the snows the last couple weeks have finally made the Incline snowy and icy. Make sure you have traction devices such as Stabilicers Lite, Yaktrax or Kahtoola Microspikes . Speaking of the Incline and snow, Roger Austin shared some great photos from this morning’s sunrise on the Incline. I really wish I would have been up there to see it. 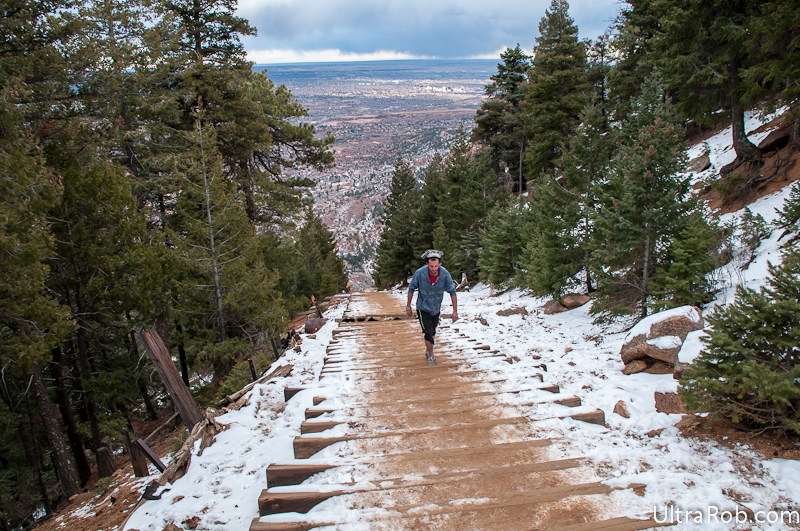 This is the first Thursday since the Manitou Incline was legalized. This means it’ll be the first legal UpaDowna Incline Happy hour. However until time change next month, the dawn to dusk rule will be broken. 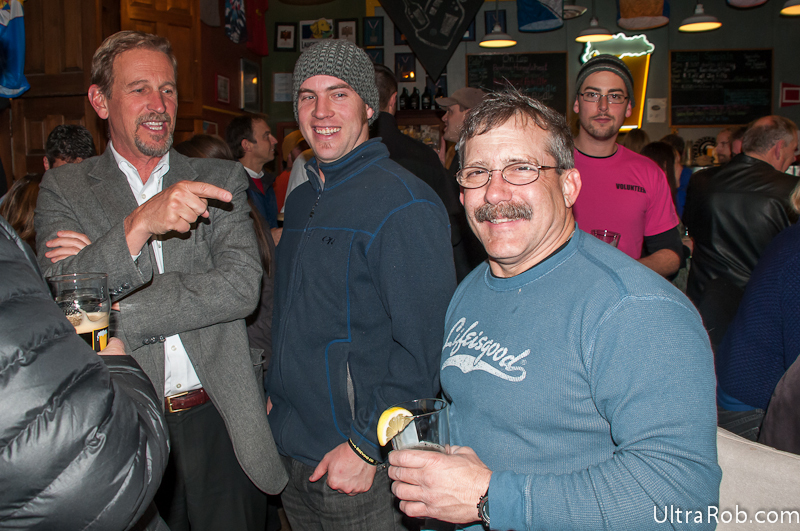 The Incline Happy Hour was started a few years ago by the great folks at UpaDowna. 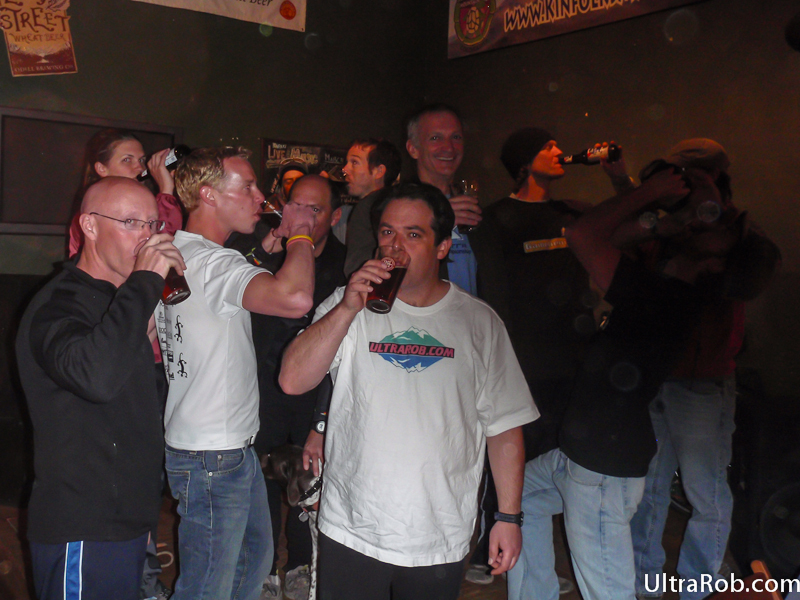 Their motto is “Up a Mountain, Downa a Beer”. Their goal is to get more people in the outdoors. Now that the Manitou Incline is legal, UpaDowna is encouraging more people to join them. They start at the bottom tie of the Incline (directions) at 6 PM and hike to the top of the Incline. 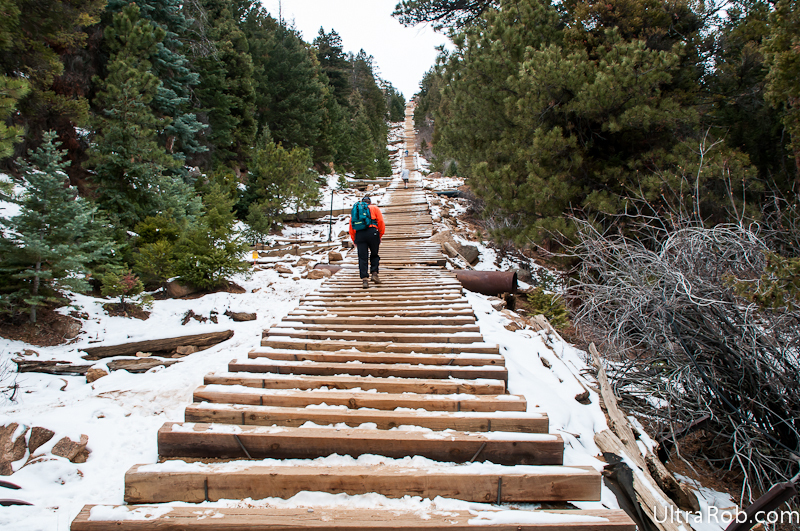 The hike takes place year round but know your limitations as the Incline can get icy and treacherous in the winter. It’s a self paced hike and not a race. It doesn’t matter what your fitness level. 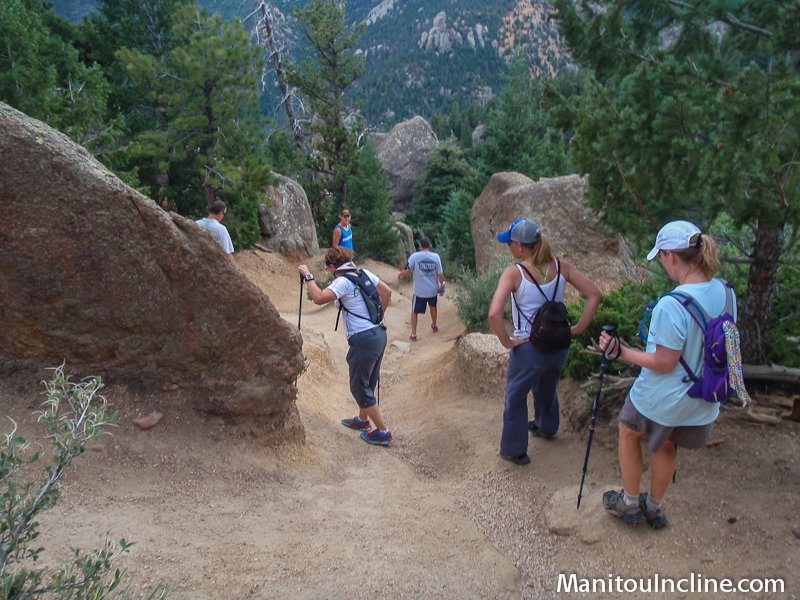 Generally people hang out at the top for a bit and then most head down Barr Trail. Until time change you’ll need a headlamp to be able to see in the dark. You can also get by with a flashlight but then your hands aren’t free for balance. Afterwards head to Kinfolks Mountain Shop in Manitou Springs. Enjoy one of the micro brews they have on tap or us hang out with other outdoor lovers. It’s located just east of Ruxton at 950 Manitou Avenue. 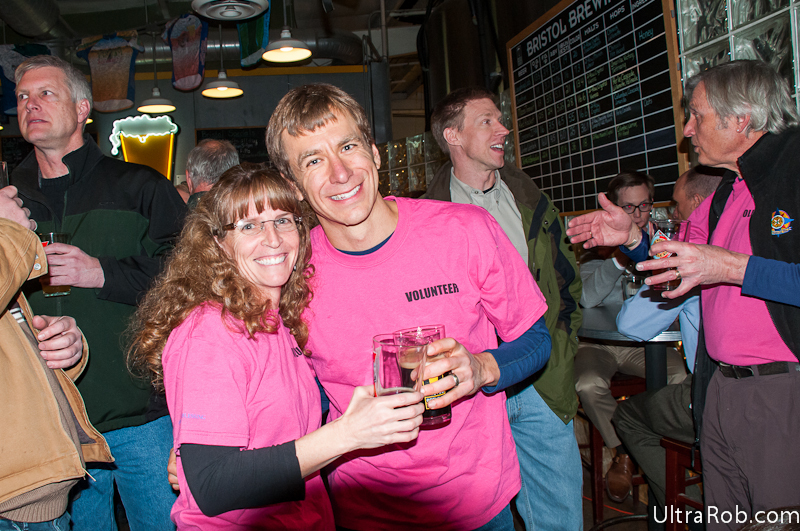 Although it’s free to join the Incline Happy Hour, you need to register and sign the waiver on Eventbrite. Not only is it a fun time, but there may be prizes for signing up and staying motivated throughout the year. 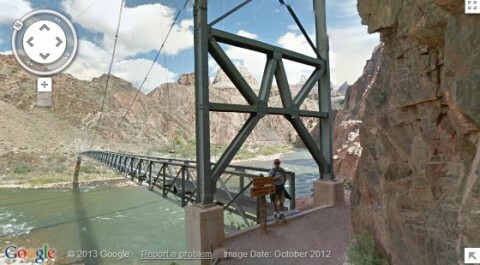 Back in October Google had posted on their blog that they had a team hiking in the Grand Canyon to get imagery for Street View. I figured they were just doing a couple of the main trails. They now have 75 miles of trails and surrounding roads live in Google Maps. The Google team their Android-operated Trekkers to take the imagery. They carried 40-pound backpacks with the 15-lens camera system. More than 9,500 panoramas are now available on Google Maps. In 2006 and 2008 I did week long backpacking trips in the Grand Canyon. I went west farther than most people go for the first trip. The trail was hard to find and I didn’t see anyone for 3 days. The 2nd trip I hiked the eastern part of the Grand Canyon and even went a little east of where the National Park ends. I can tell you there’s no way to comprehend the size of the canyon looking at a computer screen. Still I have to say what Google has done is pretty cool. Some cool places to check out are the bridge across the Colorado River to Phantom Canyon, Bright Angel Trail, South Kaibab Trail and the Meteor Crater. 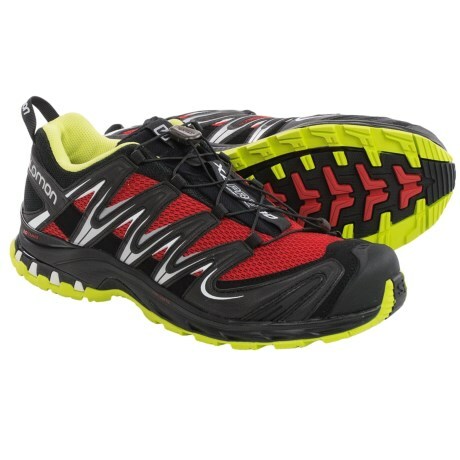 Maybe those will motivate you to take an adventure of your own in the Grand Canyon. 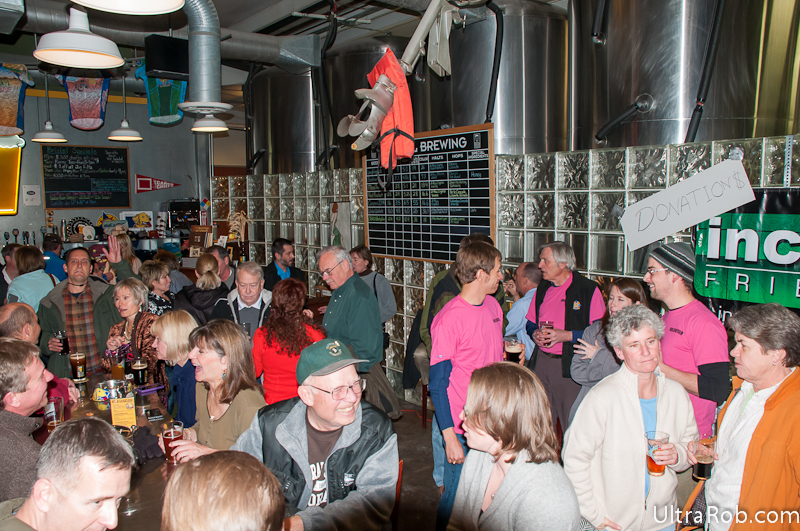 Bristol Brewing held the Incline Friends Karma Hour fund raiser Tuesday evening. They donated $1 of every pint to the Incline Friends. It was crowded while I was there. 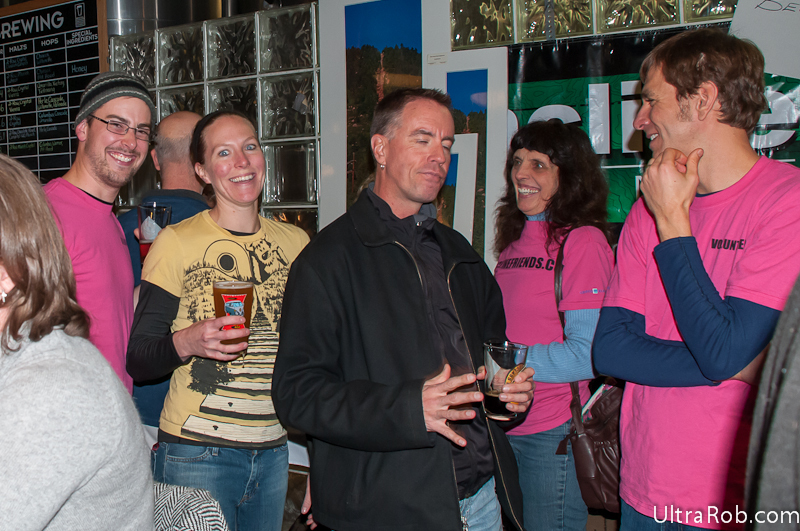 It was good seeing people I know and meeting some other Manitou Incline lovers. Other ways to help the Incline Friends is to join them, donate using the donate link on their website or putting money into the tube at the bottom of the Incline. 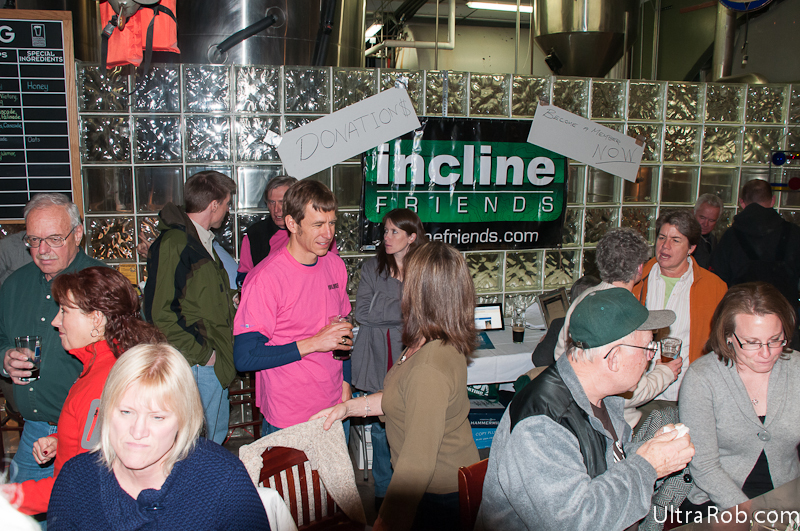 Here are some photos from the Incline Friends Karma Hour. 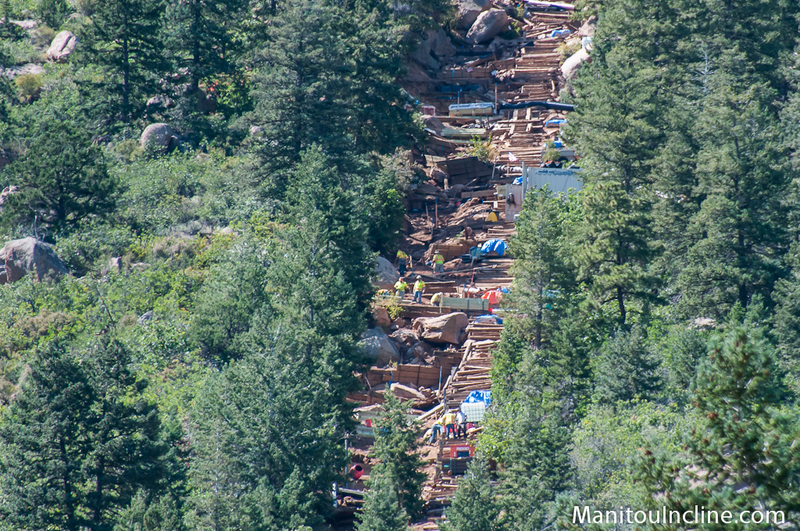 Last week President Obama signed the law clearing up the railway right-of-way issue with the Manitou Incline. 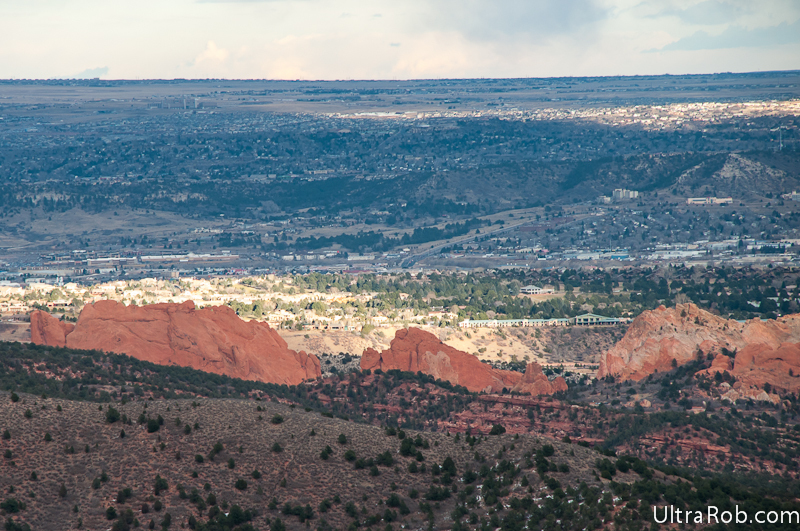 The Colorado Springs council also passed the needed resolution for legalizing the Incline for hiking. 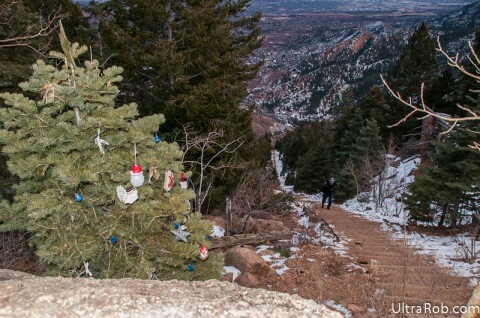 The only step remaining to legalizing the Incline is a resolution by the Manitou Springs city council. Manitou Springs council is expected to vote on January 29th. Although I think there are plans to do more than is needed, I noticed several loose ties when I hiked the Incline yesterday. Stabilizing some sections need to be done soon or more work will need to be done. The Incline Friends are tasked with raising money to repair and maintain the Incline. Total cost to implement the Incline Management Plan will run about $1 million, and the Incline Friends need $200,000 of that by the first week of March to meet a critical grant deadline. They expect much of it to come from private donors, but not all of it. 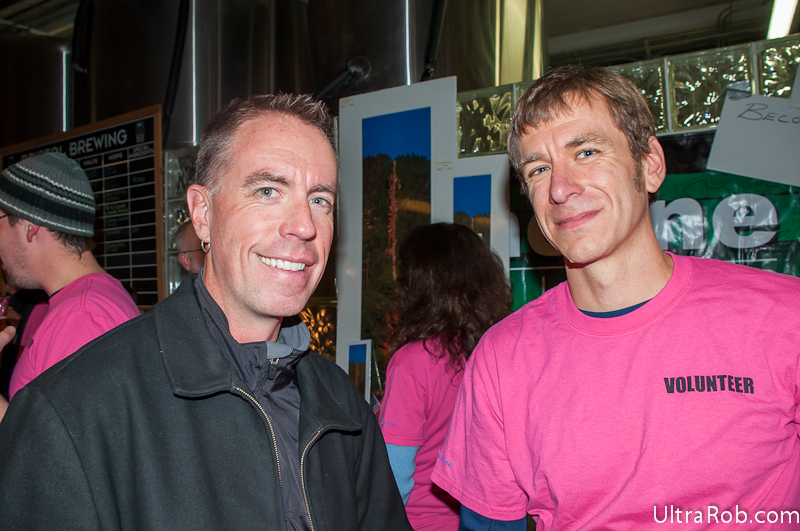 There are a few ways to help the Incline Friends raise money. Tomorrow night there’s a fun one. 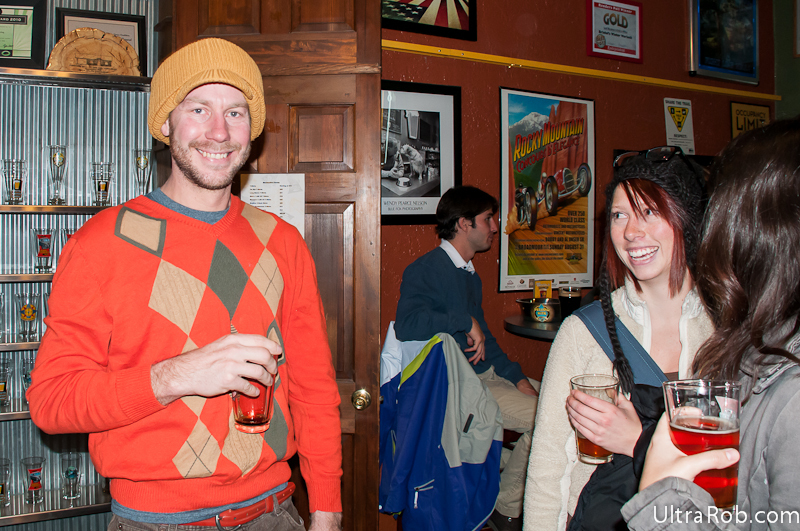 The Incline Friends Karma Hour will be at Bristol Brewery (1647 S. Tejon) from 5 to 9 PM Tuesday, Jan. 15. 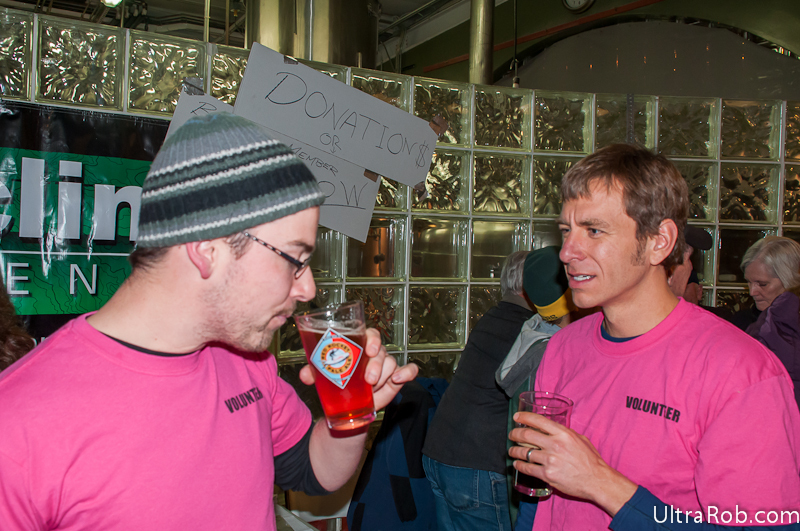 Bristol will donate $1 to the Incline Friends for every pint sold. 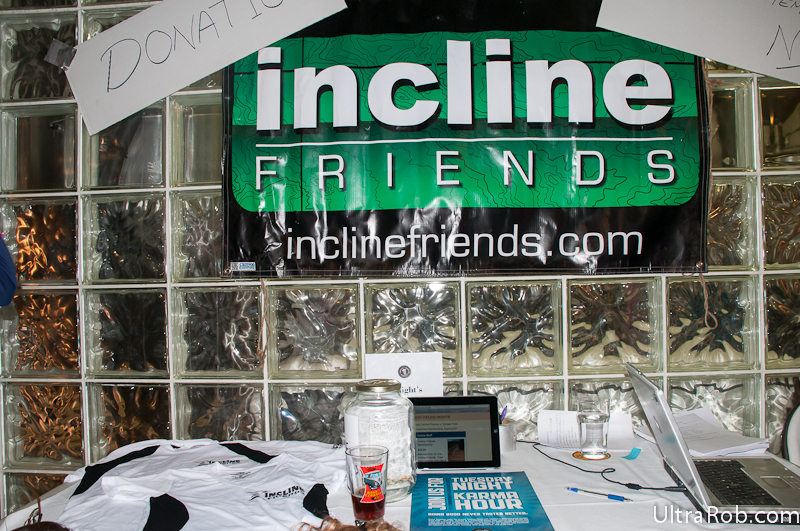 Click here for more on the Incline Friends Karma Hour. Below are some photos from hiking the Manitou Incline on December 16, 2012. 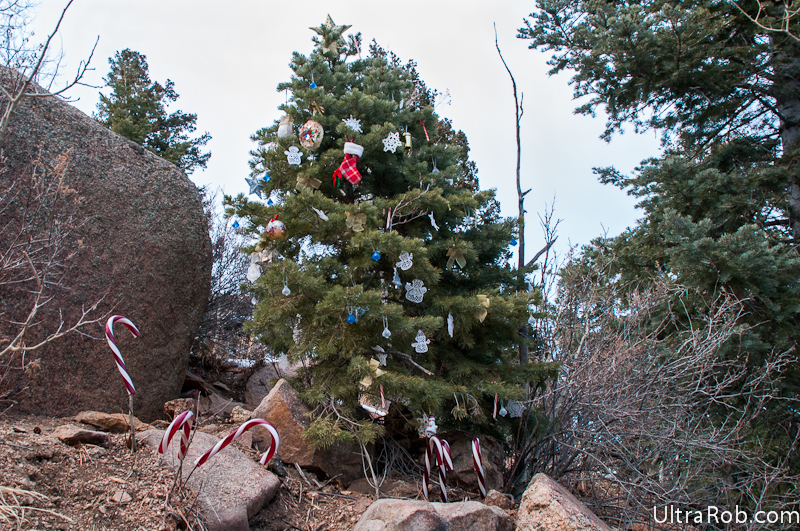 It has become a tradition for people to hang Christmas ornaments on one of the trees at the top of the Incline. 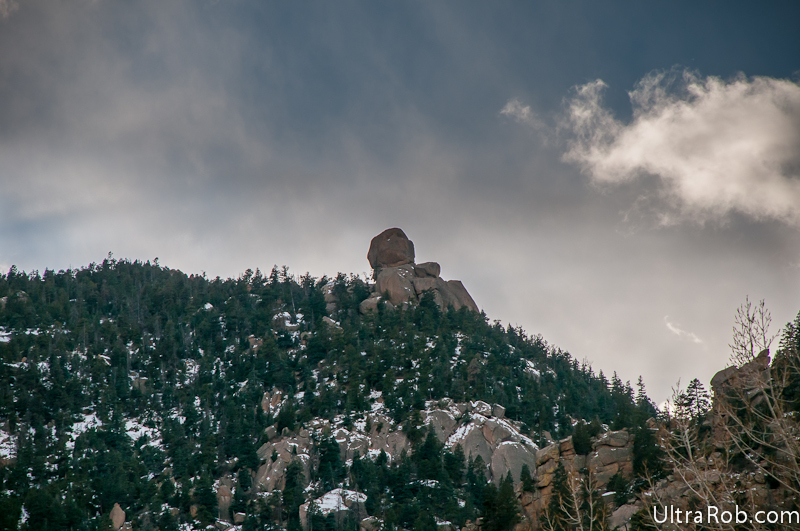 With the dry winter there was very little snow on the Incline itself or Barr Trail in December. With the cold and little snow of the last couple weeks, there was more snow on it yesterday afternoon and more fell overnight.